And then, like OUR family does, when we got back to my house, after checking out the latest changes, they decided to help me with a project. My front hall closet shoe rack. The closet is pretty shallow. Which is great for a narrow house like mine. 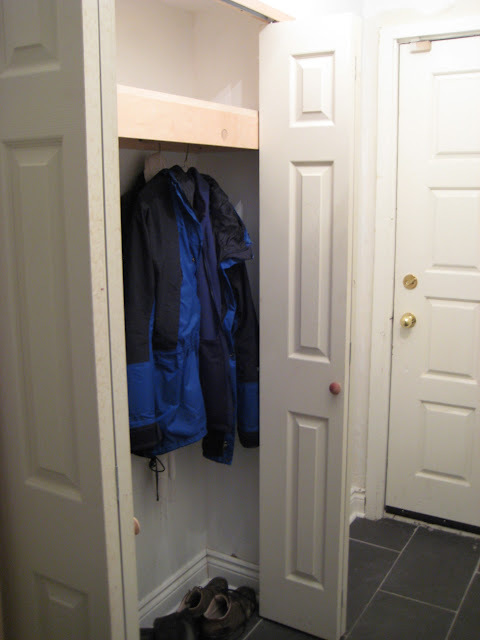 My boyfriend has a particular hate-on for the limited size of it, but there are many closet-less home owners who covet my solution. But it only works if you're OK with arranging your shoes in such a way that they don't get in the way of closing the door. My boyfriend is not OK with that. And so a solution was required to save the relationship. Turns out wooden pegs are just the thing. Mounted on the wall, angled up, you can hang your shoe heel off the pegs and VOILA -- organized, compact, non-door-wrecking shoe solution! It remained only to mount the inexpensive pine columns on the wall of the closet. Which of course also didn't EXACTLY fit the space. So we measured, cut, re-measured, sanded, found studs (in the wall, not my boyfriend), measured, pre-drilled, fit/held, drilled and drilled some more. Now it's all in place. Neat as a pin. And I feel powerful. Ready for my next big project: hanging curtains! i really like your pink pleather pants. make you look very hands.